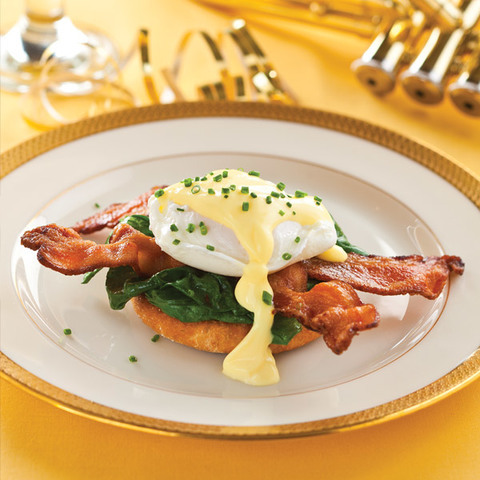 Here’s the game plan for this brunch: first, make the hollandaise and keep warm in a double boiler; cook bacon; toast English muffins; sauté spinach, and, finally, poach eggs. In a large skillet heat oil over moderate heat. Add spinach and cook, stirring constantly, until just wilted, about 2 minutes. Season with salt and pepper. Butter bottom of a large heavy saucepan and add 1 1/4 inches water. Add vinegar and bring to a simmer. Break 1 egg into a cup and slide into water. Repeat with remaining 7 eggs, spacing them apart, and poach at a bare simmer until whites are firm but yolks are still runny, 2 to 3 minutes. Transfer eggs as cooked with a slotted spoon to paper towels to drain and season with salt and pepper. Arrange two split English muffins on each plate. Divide spinach among English muffins. Arrange two slices bacon in an X over spinach and top with an egg. Spoon hollandaise over and around eggs.